Maybe twice-baked potatoes were your favorite childhood Thanksgiving treat, or perhaps later you preferred “loaded skins,” smothered with sour cream, bacon and cheddar cheese and backed with an icy cold beer. Historically, people love to stuff (and eat) potatoes. In 1876, Estelle Woods Wilcox recommended topping “Potatoes in Jackets” with breadcrumbs and cheese. Filling choices are wide open and limited only by one’s imagination. 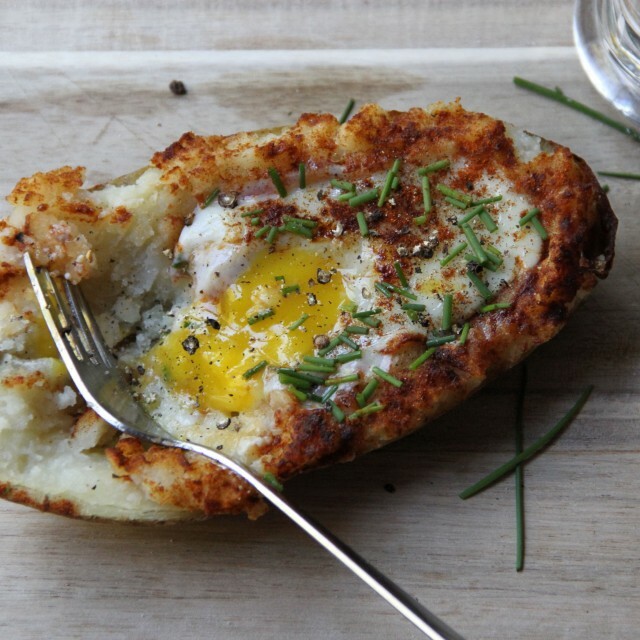 So, crack an egg into the pillowy center of your stuffed potatoes. Add smoky paprika and bake them nice and hot. Strew with fresh chopped chives for some green crunch and a bit of sharpness. Grab your fork and let the yolk of the egg mix with the buttery, salty, smoky potatoes for a twice-baked breakfast in bed that’s worthy of gorging. Preheat oven to 375°. Scrub potato thoroughly to remove all dirt from skin. Allow to dry fully. Using a sharp-tined fork, pierce several holes in the potato to allow to cook evenly. 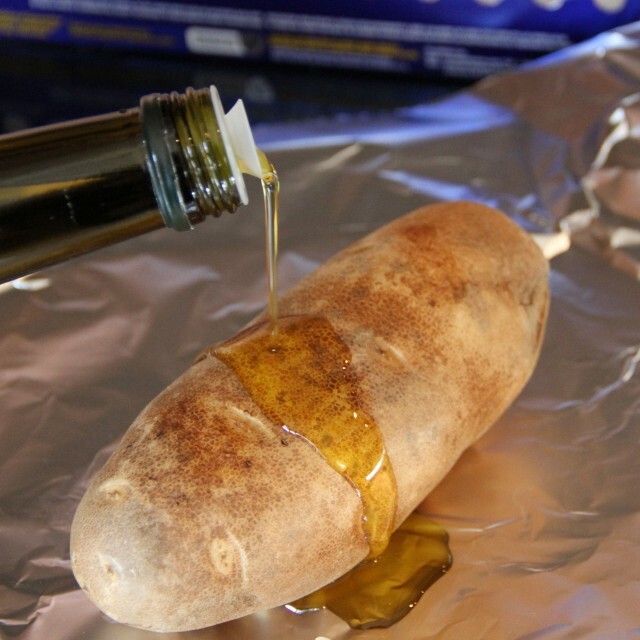 Coat potato with olive oil and sea salt. Wrap in aluminum foil, and bake until cooked through but firm, about one hour. Remove from oven and allow to cool. This step can be done the day before. When ready to cook, preheat oven to 350°. Slice potato in half lengthwise. Scoop out insides of potato halves, leaving enough potato intact to support the skin. Place scooped potato in bowl. Add butter, milk, salt and pepper and mash or beat until smooth but still somewhat thick. 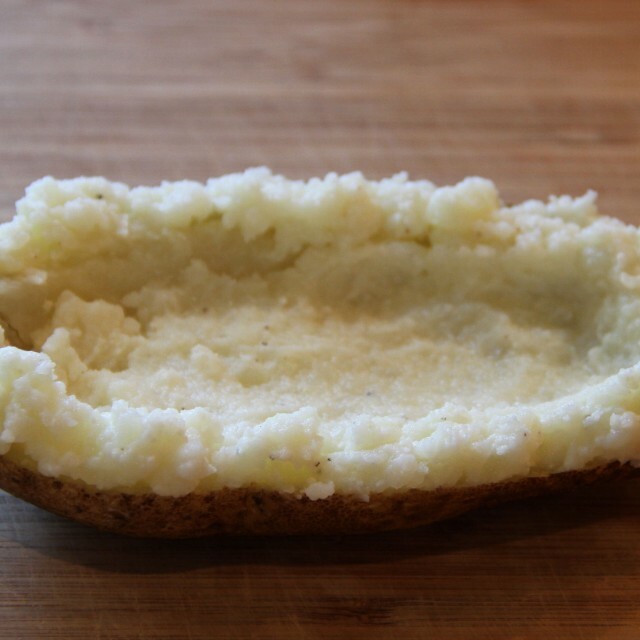 Place a portion of the mashed potato back into the scooped–out skin. Make a raised border around the potato edges with the remainder of the mashed potato, leaving a hollow in the potato large enough for the egg. Sprinkle with paprika, retaining some to use later. 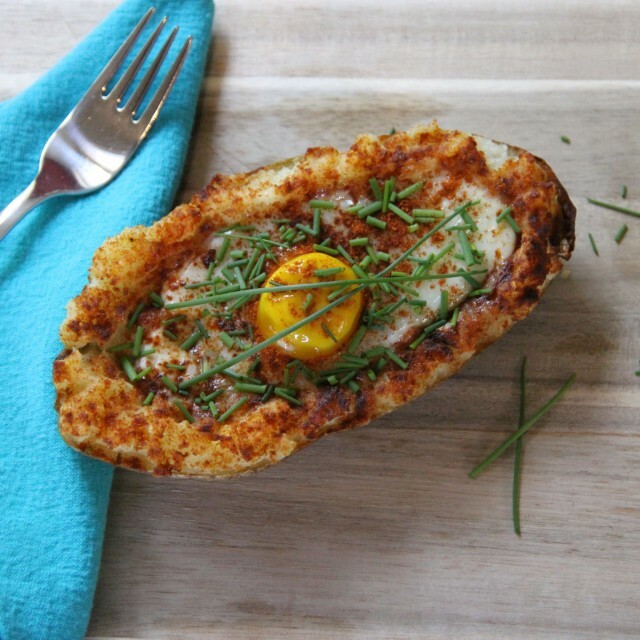 Place stuffed potatoes into a baking dish. Crack eggs one at a time into a separate small dish, then slide gently into the mashed-potato hollow. 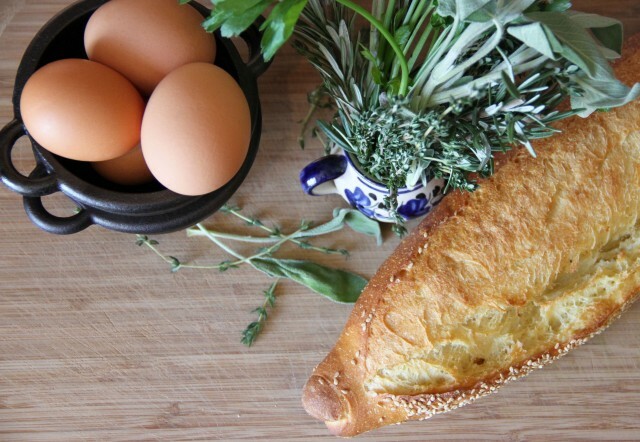 Bake at 350° until egg white is fully cooked, about 20 minutes. Remove from oven. Sprinkle with remaining paprika, garnish with chives and serve immediately. Today’s bedtime story comes to us from the lands of ancient Greece and from the skilled hands of Demi, who has authored and illustrated loads of great books, most, if not all, are either biographies of spiritual leaders, (Muhammad, St. Francis, Rumi, etc.) or retellings of folklore from around the globe. 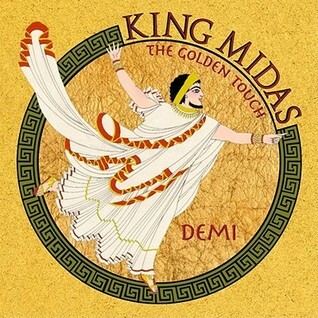 We grabbed one of the latter on our most recent trip to the library, the story of King Midas. I thought I knew the story pretty well: Midas made Apollo (or someone) happy and they granted him a wish. As we all know, the foolish king wished for the golden touch. I never realized that this was just the end of the story! Turns out that FIRST Midas angered Apollo, who gave him donkey’s ears. (I had thought that was part of a Grimms’ fairy tale.) And the LATER he please Dionysus, who granted him the fateful wish. Anyways, if you haven’t been exposed to Demi, she does really great retellings of tales, both well-known and obscure. In King Midas, she does a great job of mirroring the style of ancient Greek imagery. It’s not too short and not too long and a story which is sure to captivate kids. Imagine turning your child to gold on accident! Whoopsy! When your kid is sick, you let them do pretty much whatever they want. And they learn pretty quickly that they get to do whatever they want. So when Felix woke all flushed and feeling crummy, we set him up in his comfy chair and asked what he wanted to watch. 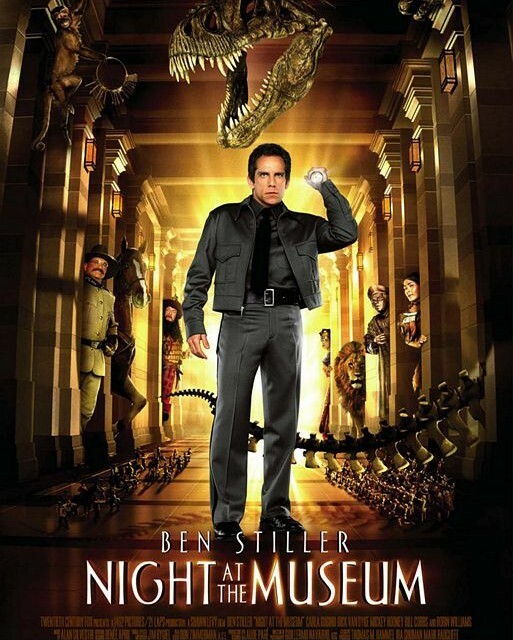 Without missing a beat, he replied, “Night at the Museum”. Honestly, there are a lot of worse movies out there that a 4 3/4-year-old might request. Like most mainstream comedy movies, it follows the required formula and chooses the meanings/messages dutifully from the list of clichéd options. In this case, it’s twofold: divorced father with no follow-through is competing with the new husband for his son’s admiration. Also, there is the love interest to win over. Of course, those parts are just to flesh out a movie which is really about a Natural History Museum whose relics come to life every night due to a magical Egyptian tablet. Larry takes a job as a night guard at the museum in order to garner a little respect from his kid. Of course when he learns that everything (including a T-Rex skeleton) comes to life at night, well doesn’t that just make Larry way cooler than the stock broker step-dad with a cell phone holster. Like I said, there are worse movies out there to watch. Owen Wilson as a tiny cowboy and Steve Coogan as his natural enemy, the tiny Roman centurion, are pretty entertaining. My kid’s favorite parts? The Easter Island head that always says, “Hey dum-dum! You bring me gum-gum?” And the scene in which Larry and a Capucin monkey get in a slap-fest. People repurpose all sorts of old buildings into homes: schools, churches, warehouses, manufacturing facilities, grain silos, and barns — just to name a few. Often, these buildings have stood vacant for many years before a visionary comes along and decides to transform it into a home. Some buildings don’t fare as well, as they have been neglected for too long and are not able to be converted into a usable space. While old buildings can present some major challenges, from the restoration and renovation to the interior design, they often turn out fantastic. These buildings give their owners an opportunity to live in something unusual and inspired; a major deviation from the typical cookie-cutter homes many of us are accustomed to. From the outside, an old barn may not seem like the most architecturally stunning building to turn into a home since they’re more or less a big rectangle. Additionally, barns are often located far outside city centers, meaning you’ll have a bit of a commute to get to work, or even run simple errands like a trip to the grocery store. However, where old barns really shine is on the inside and is why I suspect so many people are attracted to the idea of living inside one. With ample living space and high vaulted ceilings, barns can accommodate almost any floor plan you can imagine. The old wooden floors, beams and stone features provide a charming backdrop for almost every type of personal décor. You’re only limited by your imagination (and budget). That said, old barns aren’t for everyone, even if you like the style. Fortunately, you can add a bit of rustic barn charm to your modern home to achieve a similar effect. 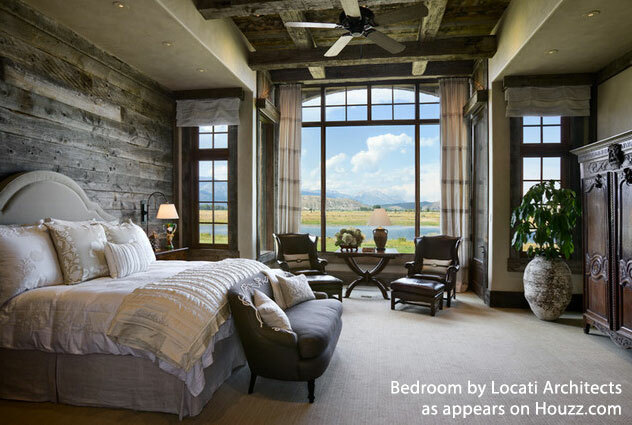 If you’re interested in seeing some of the ways people have made homes out of barns, DigsDigs has an excellent gallery of stylish barn bedroom designs. It certainly puts a whole new meaning to the phrase “raised in a barn.” If you’re not ready to take the plunge into living in an actual barn, you can also incorporate old barn wood inside a modern home to add a bit of rustic charm. 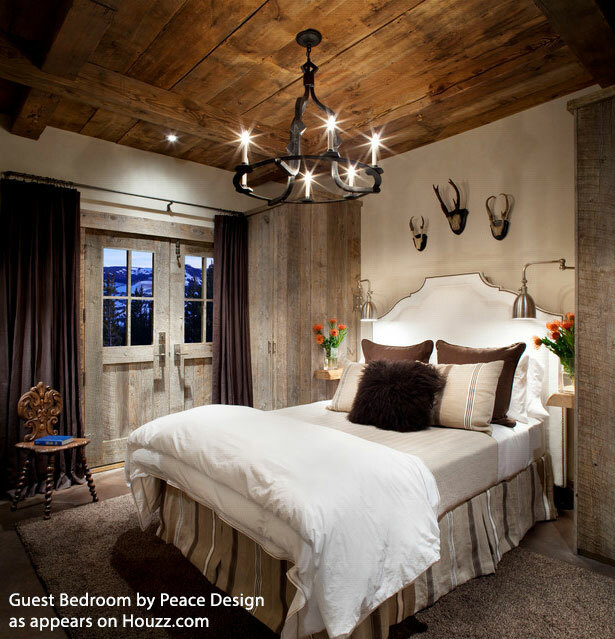 Houzz has a great gallery of “barn wood bedrooms” that’s also worth a browse. Does living in a barn appeal to you? What type of old building would you most like to turn into a home? Share your thoughts in the comments below. Next up in the Food Song category – Simon and Garfunkel’s ubiquitous “Scarborough Fair/Canticle,” title song of the1966 album Parsley, Sage, Rosemary and Thyme. I’ve listened to this song countless times – once softly, straining to hear through bedroom walls to my sister’s room as she listened over and over and over again. Later, more audibly, out on my own but lonely for home. And more recently, quieter again, as I remember and reflect on times past. It always fills me with love and melancholy, and pulls at my heart strings. But, I never once questioned the song’s history or meaning – until now. “Scarborough Fair” is an old English ballad, possibly with older Scottish roots tracing back to the late 1600s. Sometimes the place name changed, and often the refrain changed, with “parsley, sage, rosemary, and thyme” not appearing until the 1800s. And the meaning of the herbal refrain? Theories abound. Here’s mine: every herb has its own meaning, translating “parsley, sage, rosemary and thyme” to “festivity, wisdom, remembrance, and courage.” A perfect love potion to overcome the impossible tasks set forth in the lyric, and return two hearts to one. Sigh. Cut or tear bread into bite-sized cubes (should be around 6 to 8 cups) and set aside. 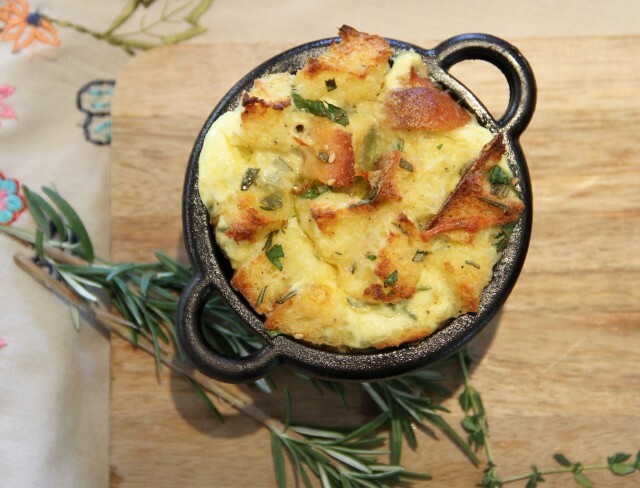 Grease a 9×13-inch baking dish, or if you prefer, 8 ovenproof serving-sized dishes, and set aside. 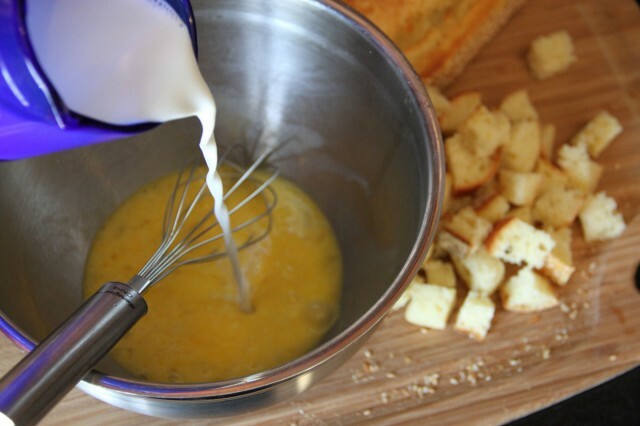 In large bowl, add eggs and whisk until slightly thickened. Whisk in milk. Add shredded cheese, chopped herbs, butter, salt and pepper. Mix well. 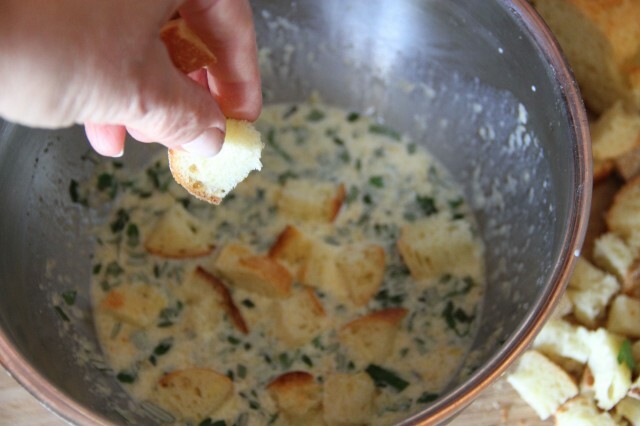 Add bread cubes to egg mixture and stir well to make sure the herbs are evenly distributed. 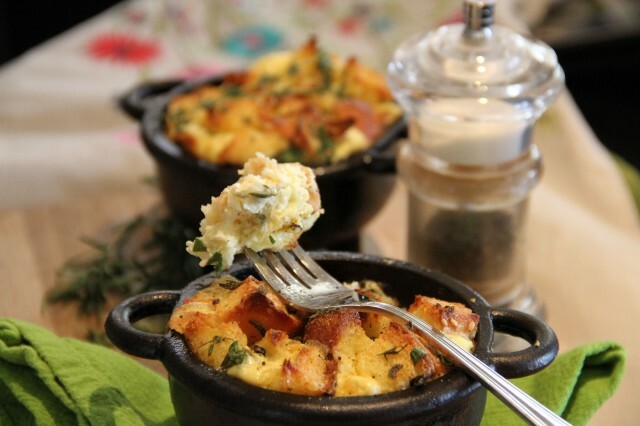 Pour egg-bread mixture into serving dish (or dishes) let sit for 20 to 30 minutes to allow bread to absorb liquid. Preheat oven to 350°. Bake bread pudding for 40 to 45 minutes, until it is puffed up and the top is golden brown. If you are using individual serving dishes, check for doneness after 30 to 35 minutes. When done, the bread pudding will be puffed up and browned, and egg will be fully cooked and not jiggly. Serve hot with fried ham or bacon, if you like.